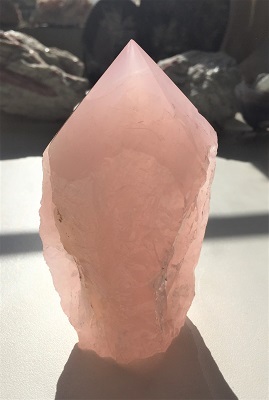 Stunning soft pink colored Rose Quartz semi-translucent crystal point from Brazil. 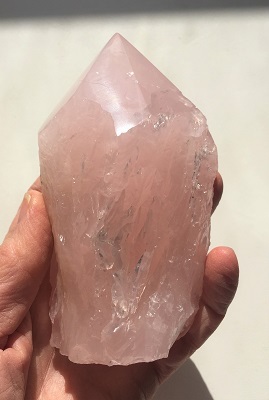 This Rose Quartz Crystal point provides focus for energy that vibrates with love and compassion encouraging these beliefs to find their way into expression. Rose Quartz is calming, reassuring and excellent for use in trauma or crisis. Rose Quartz strengthens feelings of empathy and sensitivity and aids the acceptance of necessary change. 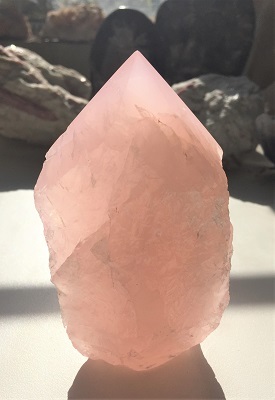 Rose Quartz encourages self-forgiveness and acceptance. Rose Quartz restores feelings of trust and harmony and encourages unconditional love in relationships. If you have loved and lost, Rose Quartz comforts you through the process and feelings of grief. In healing, Rose Quartz helps to strengthen the physical heart and supports those who are experiencing palpitations and irregular heartbeat. 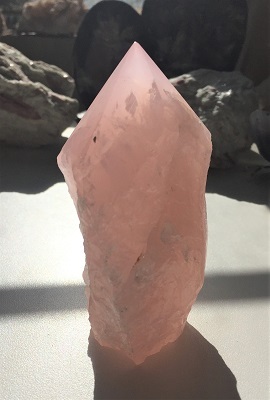 Rose Quartz aids the circulatory system and releases impurities from body fluids. Placed on the thymus, Rose Quartz may be helpful with chest and lung problems. Rose Quartz heals the kidneys and adrenals and alleviates vertigo.